From the crucifixion of Jesus to the crumbling Latin Empire, the crown of thorns has (purportedly) withstood the test of time. So it should come as little surprise that a fire that threatened to destroy the centuries-old Notre Dame cathedral where the religious relic was housed was unable to cement its demise. 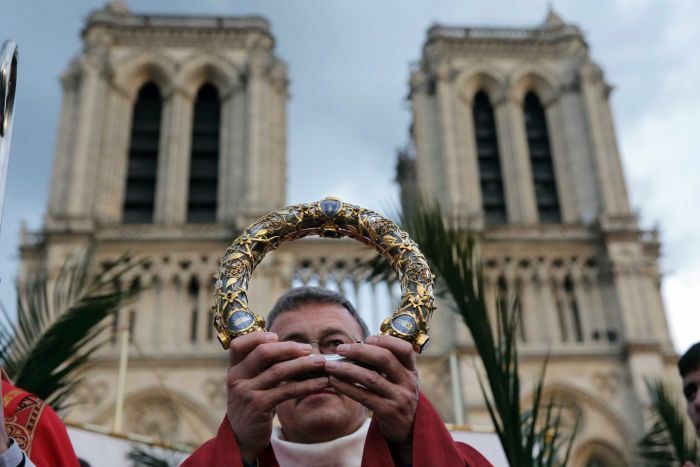 But as authorities count the cost of the treasure trove of historic and religious artefacts lost to Tuesday’s blaze, some have questioned how Parisians even got their hands on a relic purported to have originated in first-century Judea. So what is the significance of the crown of thorns to the story of Easter? Where does it come from? And can we be sure it’s actually the real deal? For those more spiritually inclined, according to three of the four canonical Gospels, a woven crown of thorns was placed on the head of Jesus in the lead-up to his crucifixion (this was sometime between AD 30-33). 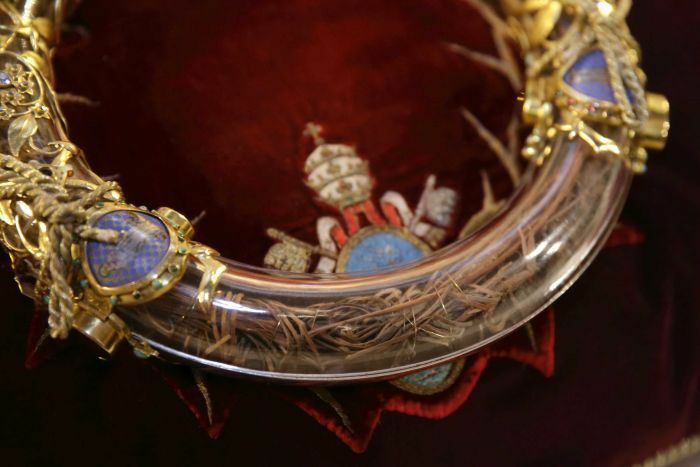 The crown is considered one of the Instruments of the Passion (otherwise known as Arma Christi) — objects associated with Jesus’s Passion in Christian symbolism and art — and was employed by his captors to mock his claim of authority and cause pain. “And when they had platted a crown of thorns, they put it upon his head, and a reed in his right hand,” the Gospel of Matthew says (King James Version translation). The relic is further referenced by the Church fathers — ancient and influential Christian theologians and writers — and has become synonymous with artistic interpretations of the Passion. Texts dating back to about AD 530 claim the crown was on show in the “Basilica of Mount Zion” — a hill in Jerusalem just outside the walls of the Old City — where it was believed to have been venerated for some time. Then things get a little bit trickier to trace. At some point over the next couple of hundred years, the crown was transferred to Byzantium (an ancient Greek colony), where several thorns were removed. Justinian the Great, the Emperor of the Byzantine Empire, purportedly gave a thorn to Saint Germain, the Bishop of Paris. Some years later, Irene of Athens, a Byzantine empress, sent Charles the Great (the Holy Roman Emperor) several thorns to be kept in Aachen. Then, like a blender given to you at Christmas, they were re-gifted. Charles the Bald (who was purportedly excessively hairy) and Hugh the Great (not to be confused with Hugh the OK) were among the litany of recipients. Eventually, thorns found their way to Malmesbury Abbey in England and Andechs Abbey in Germany. Slowly but surely, the crown (or at least part of it) made its way to Europe. But the TL;DR of it is this: the Latin Emperor of Constantinople realised he was a bit of a Neville No Friends and used it to try and buy support. In 1238, Baldwin II offered the crown to Louis IX, the King of France, to gain backing for his tottering empire. It ended up in the hands of the Venetians for a while as security for a heavy loan but inevitably found its way back to Paris. King Louis XI commissioned the Sainte-Chapelle to house it, where it stayed until the French Revolution when it was deposited in the Cathedral of Notre-Dame. And that’s where it had been ever since… until this week. The Mayor of Paris, Anne Hidalgo, says it’s now in a “safe place” along with the tunic of Saint Louis and several other major works. John Calvin’s Treatise on Relics. Indeed, John Calvin, a key figure in the Protestant Reformation, was very much against them. 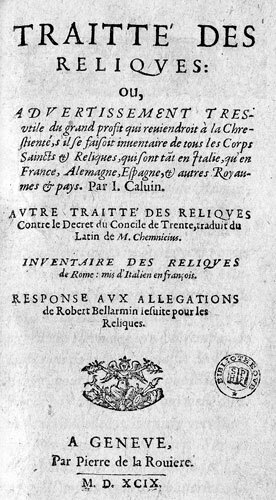 He published his Treatise on Relics in 1543 in which he argued the veneration of relics had become idolatry. He also pointed out there was no mention of the keeping of the relics of Christ or anyone else in the earliest church writings. “The deliberate avoidance of anything savouring of idolatry in the early church made it most unlikely that any such relics would have been kept in the first place. Professor Cameron noted that most relics began to be exhibited in the late Middle Ages, and often had telltale markers of that period. His conclusion was that most, if not all, had to be forgeries.